These peaks are part of the Manang Himal, which are quite rightly included in the larger Damodar Himal, the eastern limit of which runs south from Chako and Peak 6687 in a north-to-south direction along the Hunlung Khola, Nar Khola and Phu Khola. The south it is bounded by the Marsyangdi River and the Mesokanta La. 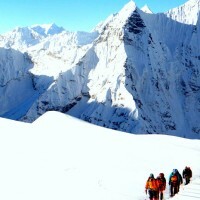 To the west its limit is the Kali Gandaki and to the north the Parchekya La (5,447m). 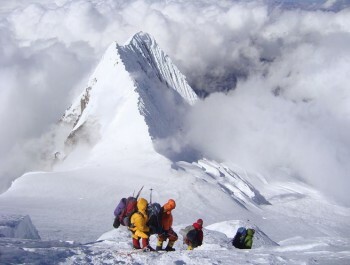 There exists considerable confusion with regard to the name and location of the Chulu peaks and what summit actually constitutes Chulu West and Chulu East, since it is soon becomes apparent to anyone that has climbed in the range that several other summits close by, which are actually part of the Chulu massif, are not indicated on present maps of the area. 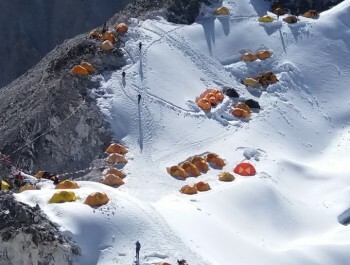 For the sake of clarification, four summits can be included in the Chulu group, two of which are possible on the permit for Chulu West and two on the Chulu East permit. What is apparent is that the available trekking map is highly misleading. 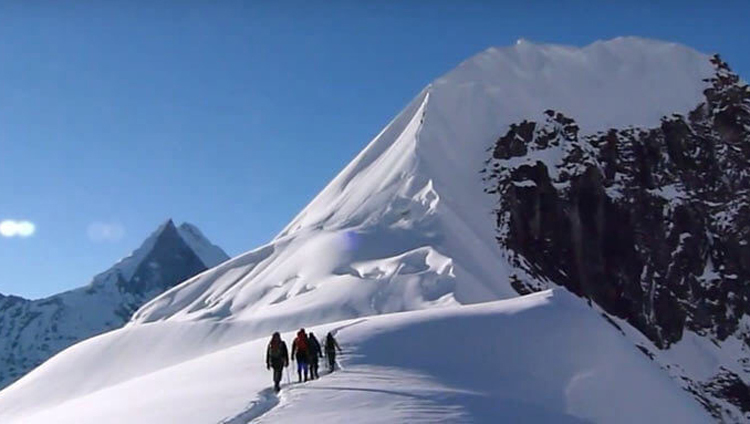 Nepal New Generation Trek and Adventure representative will greet you in an airport & transfer you to hotel, here you will be formally introduced to your Guide and the activities to be enjoyed over the next few days. We will also ask for your passport photographs and any other details required for your trek permits, at this stage. Free day in Kathmandu. You can do sightseeing on your requset. You will be driven for around 6 hours today to Besi Sahar, the Lamjung district headquarters. Here you will be shown to your hotel for the night. We have to drive from besishar to chame to reach at our trek starting point. Enroute, we see more of countryside of Nepal that offers greeneries, rivers, villages, terraced rice fields and beautiful mountain sceneries. Today is a fantastic day of challenging walking and spectacular mountain and valley scenery. We lace up the boots well today. The steep trail initially takes us through dense forests along the northern valley wall. When we reach Bratang we turn northward again and head through a very narrow section of valley with huge cliffs and landslide scree slopes. This is a dramatic place to trek as you look down into the valley and then high up to the Annapurna massif peaks above. This is trekking in Nepal at its very best. Today we cross the river a number of times via high and dramatic suspension bridges. As we progress higher beyond the narrows we reach a wider section and the valley of Manang and its high snowy peaks towering above. A wonderful day of walking and exploring ends at the village of Lower Pisang. The trail has many branches and options today, but they all take us higher up the valley under the towering peak of 7,555m Annapurna III to the south. We have now moved deeper into the Annapurna massif rain-shadow region and so the landscape progressively changes to more stunted vegetation and more bare-rock slopes. This is now the more harsh, cold and dry climate of the high plateau of Tibet. We will take a short break for some spiritual advancement at the Barge Monastery where we have a chance to glimpse the life of the Buddhist monks who live here throughout the year. Today we let the heart, lungs and muscles recover and give our boots a quick clean too. 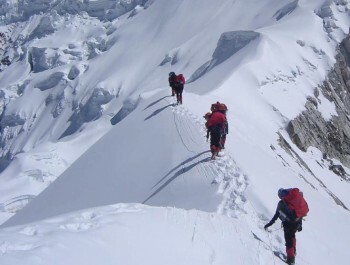 Each day we have been gaining altitude, but we must do this in careful measured stages to ensure proper acclimatization for the higher altitudes and high passes ahead. So today we just do some short walks to explore the region around Manang. Options include a visit to the Buddhist Bhojo Gompa or a short walk across the valley floor to Gangapurna Lake which sits at the foot of a steep valley cut into the southern valley wall. But most importantly today we must continue to acclimatize for the challenging days ahead. 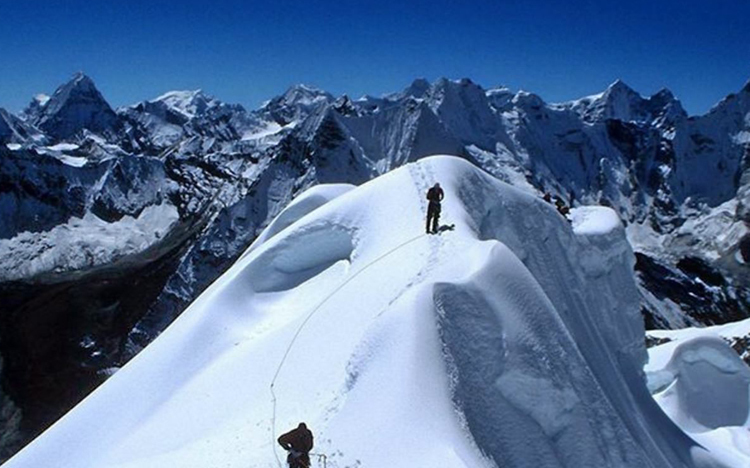 Today we gain over 600m in altitude and by the time we reach Yak Kharka at 4,110m we will have just 62% of sea level oxygen available with every breath. The trail heads north as we ascend a side valley out of the main Marshyangdi Valley we have been trekking since the trek commenced. We head higher through even more stunted vegetation. Now the local people must rely upon their hardy livestock to eek out a living from the sparse mountain pastures. The trail winds along the mountain foot-slopes that sit high above the rocky stream bed below. The views to the valley floor and high peaks above are spectacular. We pass through high meadows where sheep, cattle, yaks and even horses graze. We pass a number of small communities and often meet shepherds with flocks and finally reach the little village of Yak Kharka. 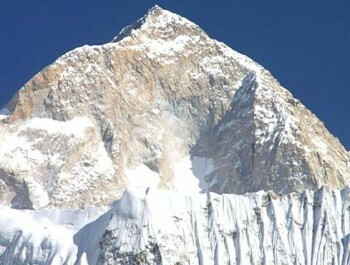 Today, we will follow a steeply climbing trail to reach at Chulu Far East Base Camp. The climbing trail at times crosses rocks as well. 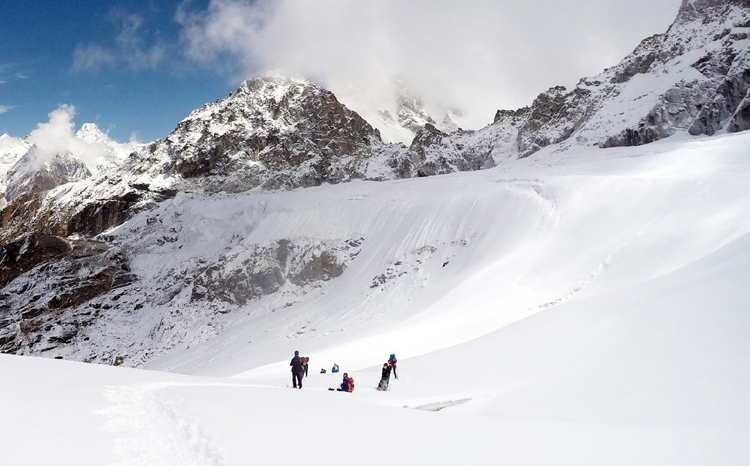 During the trek, our journey will be accompanied with Annapurna Valley Himalayan views. Today is the big day. We are summiting Chulu East. 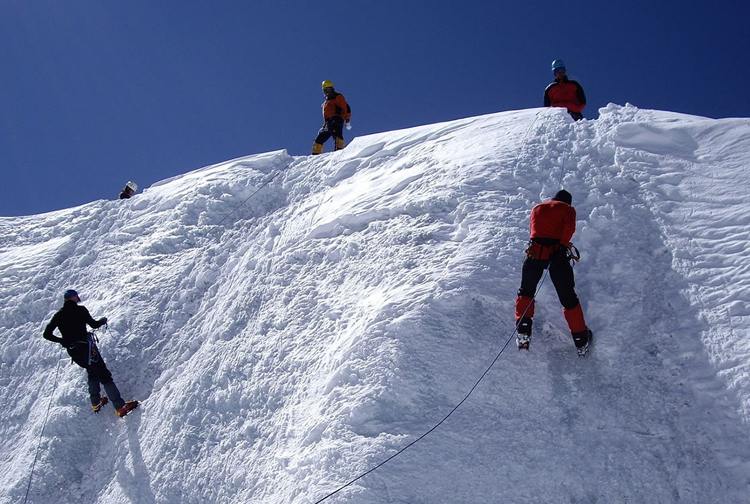 The trail to Chulu East initially opens up to a snowy ridge, which can be easily traversed without much of alpine skills to Chulu East Summit. From the summit, the views of snowcapped peaks in all directions, the tranquil Manang Valley is the biggest reward. 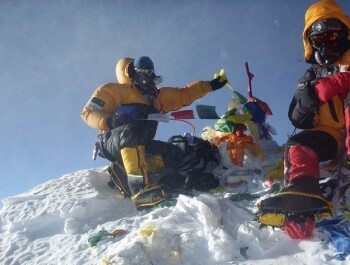 After the summit, we trek down on the retracing trail to Chulu East Base Camp for the overnight stay. The trail heads north as we ascend a side valley out of the main Marshyangdi Valley we have been trekking since the trek commenced. We head higher through even more stunted vegetation. Now the local people must rely upon their hardy livestock to eek out a living from the sparse mountain pastures. The trail winds along the mountain foot-slopes that sit high above the rocky stream bed below. The views to the valley floor and high peaks above are spectacular. We pass through high meadows where sheep, cattle, yaks and even horses graze. We pass a number of small communities and often meet shepherds with flocks and finally reach the little village of Yak Kharka. Today we face the greatest challenge of the trek as we attempt to cross the Thorong La Pass. 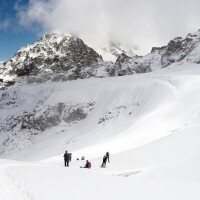 Your guide will keep a careful eye on the weather conditions and the condition of every member of your trekking group. 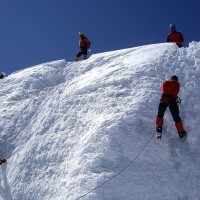 High altitude passes must be treated with respect. The Thorong La Pass will take us to 5416m or 17,764ft altitude where each breath brings in just 52% of the oxygen available at sea level. So your lungsm heart and legs will be working hard today and your brain will not be at its best. 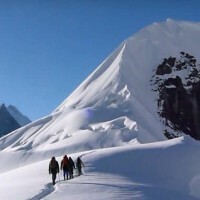 That is why it is always best to trek with an experienced guide who can function normally at high altitude and make the right decisions that reduce the risks for his or her trekking group members. It will be a long day so expect to start early. The trail will wind up the valley wall to the lowest crossing point possible in this part of the Himalaya ranges – the Thorong La Pass. But you can still expect plenty of ice and snow on the trail and at the top of the pass. So tread carefully and take your time. As you head higher the mountain views get even more spectacular as you start to view many of the peaks from their own level. 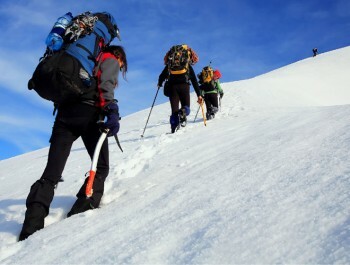 But all going well you will have prepared properly and should have no trouble reaching the high pass and enjoying the achievement. But then it is time to start the descent and head down the path to the historic Hindu and Buddhist pilgrimage village of Muktinath. For many centuries Muktinath has been an important place of pilgrimage for Hindu and Buddhist followers. We will start the day by visiting the Vishnu Temple and Gompa and learning more about the cultural and religious significance of the rather remote village of Muktinath. We will then spend much of the rest of the day winding along descending trails from Ranipauwa to Kagbeni. Today is easy walking along the Kali Gandaki river bed as we descend gently to Jomson. The mountain scenery is spectacular even as we reach the end of the trek. We walk through the largest gorge in the worl\d with 7,000m and 8,000m snow-capped peaks of Dharalgiri and the Annapurna Massif towering above us to the west and east. We end the day and the trek at Jomsom, the main airport servicing the region. Your legs can finally rest as today we catch an early morning flight from Jomsom to Pokhara. In little more than half an hour you will fly over spectacular river valleys with the summits of Annapurna on one side and Mount Dhaulagiri on the other – so have your camera ready and grab a window seat. All too soon you will have left the Annapurna wilderness and be back in the noise and bustle or urban Pokhara. 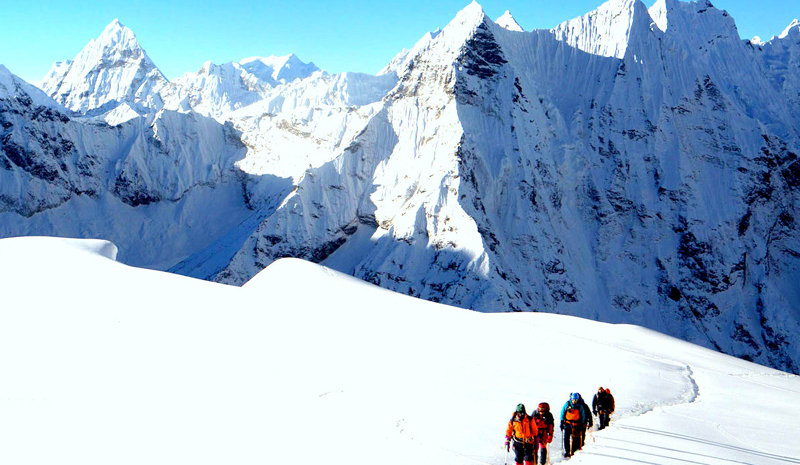 As an optional extra component of your trekking package you may choose to take the 30 minute flight from Pokhara to Kathmandu. 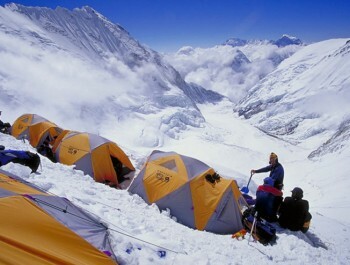 Or you may choose the road option and extend your experience of Nepal that little bit further. Either way, by this afternoon you will be back in busy, and often dusty, Kathmandu. In the afternoon time is your own to explore or perhaps go shopping. In the evening you will collect you from your hotel for a farewell dinner and cultural Nepali dance – so bring your comfortable dancing shoes! This is the free day for a little more shopping and exploring. We will meet you at your hotel and take you to the airport in plenty of time to meet your flight home. 5 Nights Accommodation in Kathmandu at a tourist class Hotel on bed & breakfast plan as per given itinerary. 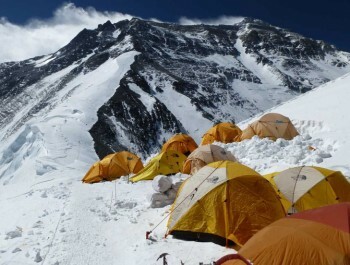 All kitchen equipments; kitchen tent, dining tent, toilet tent, chairs and tables at the base camp. Per Person 45 KG. Equipment’s luggage / barrels allowed till to Base Camp. 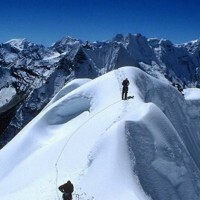 Trekking/ climbing Guide, , porters salary, fares and taxes. Lunch and dinner during your stay in Kathmandu . Hotel after 5 Nights stay in Kathmandu. Garbage deposit US $ 2000.00 for a team. After expedition deposit will be refundable.